Come join the Republican Women's Club of Katy as we phone bank and block walk. Help us Keep Texas Red by adding your name to the interest list below. Just click the button to add your name to the list (must log-in to join). Join me up to be on the Katy Strike Force! 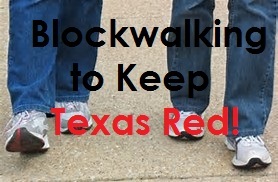 We will make sure you are notified when Block Walks are scheduled throughout the Katy area. It's fun, great exercise and quite eye opening as you talk to people in the community. Phone banking will be every Tuesday & Thursday at the Katy Republican Office at LaCenterra from Noon - 4:00 PM. Calling voters for our candidates is the best way to recognize who their supporters are and to determine areas where more work is needed. Candidates need us and appreciate our time and effort. If there is a certain candidate you want to work for, let us know. We will contact their office for information. Can you commit a few hours on either of these two days? Be sure to purchase your Republican Women's Club of Katy T-shirt! This is a great tool to advertise our organization while Block Walking. 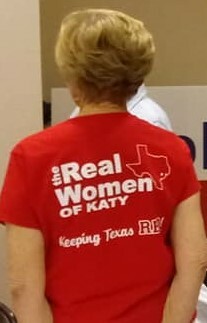 We are the REAL WOMEN OF KATY KEEPING TEXAS RED! Click here to purchase a T-shirt. Sign up here to be a part of The Katy Strike Force! Sign me up for the Katy Strike Force!